As January 20 turns into January 21, a super moon will shine brightly in our night sky. And so will a blood moon. And a…wolf moon?? And a lunar eclipse! It’s the motherload of lunar extravaganzas, all happening in one night. 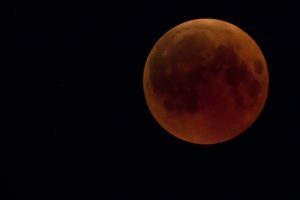 A few of us will be gathering at Bayou La Terre Sunday night for the Super Blood Wolf Moon Total Lunar Eclipse. You are invited to join us. The eclipse will start at 9:33, and reach totality between 10:41 and 11:43. Clear skies are predicted all day Sunday and Monday. Sunday night will be cold, with a predicted low of 31 in our area. For more information, please contact surregionalist@bellsouth.net.